This post is filed under Chicken, Frozen, Hall of Fame (Taste), Honey, Oven, Tyson. Those actually do look appetizing. How much was the box? ….and what’d you use as your dipping sauce? Is the box suggesting that these be served falling from the sky and rolling around on the table? Is it a chicken “wing” or “wyng”? I’ve had these before. I’ll have them again. That said, I’m not proud. I wonder If you could create a better result by tossing some plain chicken nuggets in the bbq or hot sauce of your choice. 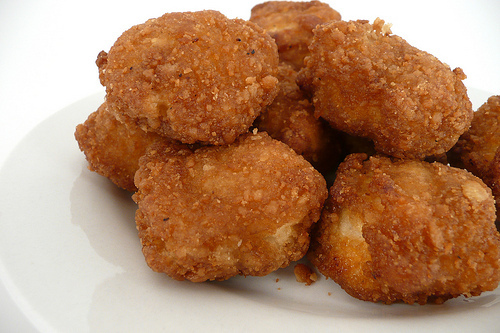 Could always buy some boneless chicken thighs, roll ’em in flour, breadcrumbs, and egg, then deep fry and shallow fry in some decent bbq sauce. Why are these wyngs and not wings? Is this like how vegetarian chicken substitute is called chik’n instead of chicken? I tried these a while back and thought they were pretty bad. The couple first bites are not bad but the flavor becomes overwhelming as you eat them. Wow, I didn’t even notice that until it was brought up in the comments. 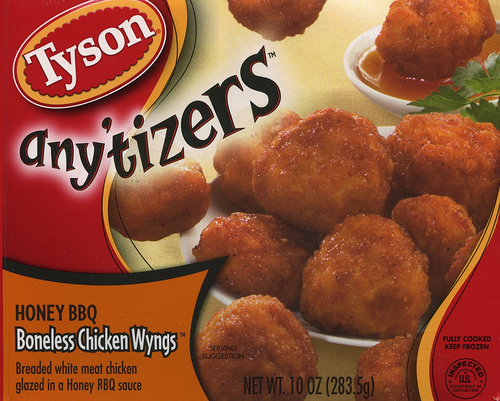 I think they’re “wyngs” because they’re not actual chicken wings, just chicken meat. 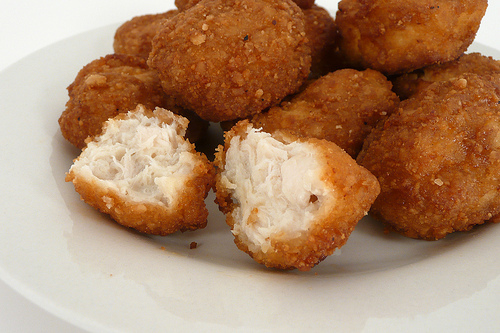 It would be impossible to have a truly boneless chicken wing.